I have now released a version of GogTasks supporting Outlook x64! Go to the download section to get it! 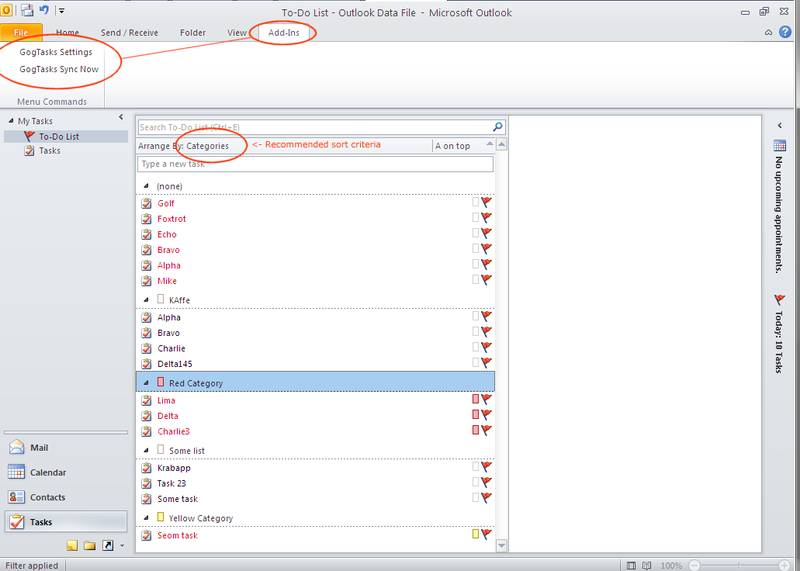 The same binaries also work for Outlook 2010 x86. There are some more bug fixes done compared to GogTasks v2.2 for Outlook 2003/2007 - I will get back to this in the change log. I will also release a new version for 2003/2007 with the same bug fixes shortly. I have to take back 50% of the truth in the last post - GogTasks only works for the 32 bit version of Outlook 2010. At the time I tested, I didn't even know there was a 64 bit version of the software. Now I know, and I can confirm that GogTasks does not run on it. It needs to be compiled for the 64 bit architecture, but it has proven a bigger challenge than expected. I am working on a solution that I hope to get working soon. I have now tested and verified the functionality of GogTasks under Microsoft Outlook 2010. No code changes were required from my part to make the software work under the latest edition of Outlook. Hence, Outlook 2010 is now officially supported. You will find the settings menu and the synchronize button under the Add-Ins ribbon after installing.